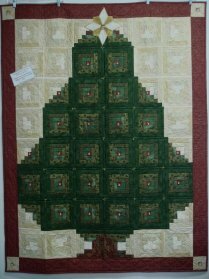 The quilt is made up of 7" log cabin squares. The tree is folded logs and the background is flat logs, all sewn to muslin + batting foundation squares. 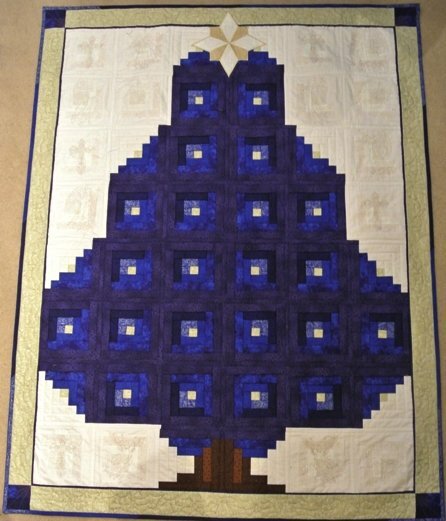 The tree blocks are quilted as you create the blocks. The background blocks can be quilted as they are created or you can wait until the quilt top is put together and then quilt the background quilts in the embroidery hoop or with free-motion quilting. Sashing strips join the log cabin squares together. The top ornament is created as a ‘stand alone appliqué’, either on the sewing machine or in the embroidery hoop. It is sewn to the quilt after the borders are added. Borders can be quilted and then added to the quilt with sashing strips or the borders can be added to the quilt and then quilted. Borders can be quilted in the embroidery hoop, with a presser foot on the sewing machine or free motion. The finished quilt size is approximately. 51” x 66” (with ~4" borders) but it can be made larger by simply adding wider, or more, borders. The quilt center (no borders) is about 42" x 56", a nice size for the center of a queen size bed. In addition to instructions and patterns for creating the quilt and quilting it, for those who have embroidery machines, digitized designs for the border holly leaves, for a geometric quilting design for the background blocks and for creating the top ornament in the hoop are included. Bring a sewing machine and your fabrics. Fabric requirements and supplies list available.